Facebook’s stock price and social sentiment, plotted on a graph. Is there a link? 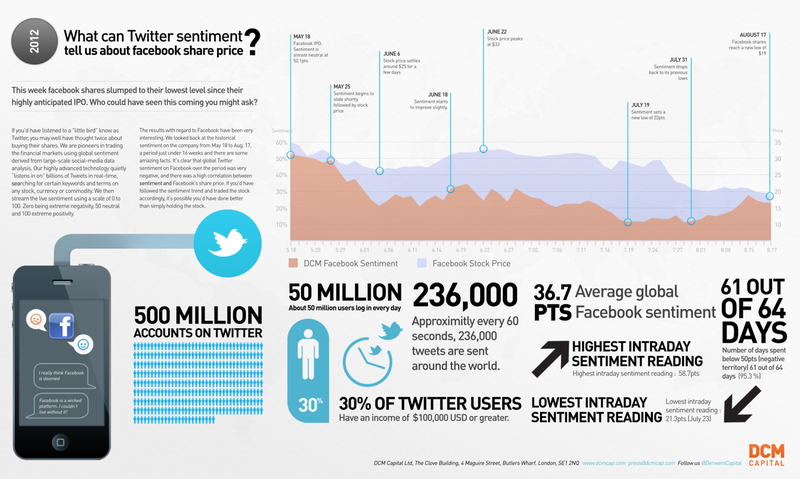 As we’ve reported in the past, there’s academic evidence that social media sentiment can be used to predict future movements in the stock market. One UK company even launched a (short-lived) hedge fund based on the principle. That company, DCM Capital (AKA Derwent Capital Markets), has since decided to offer its technology in the form of an app instead of directly for investing. To drum up interest in the recently released app, they’ve published the graph below, which appears to show that on Twitter, sentiment about Facebook (in pink) dropped ahead of an actual slump in stock price (in blue) just over three weeks later. Is this evidence that social sentiment accurately predicts stock price? No, but it’s interesting to see how stock price ‘outperformed’ sentiment for several weeks before tying up more closely towards the end – seemingly showing sentiment ‘predicting’ the future price. Even during that middle period, dips and rises in sentiment are just ahead of adjustments in stock price. You can make statistics and graphs say whatever you want with wisely chosen datapoints, so I wouldn’t go treating this as conclusive proof of anything, but it will certainly be interesting to see similar graphs from DCM in the future.